Tonight marks the second LIVE broadcast of my new online garden television show, “Garden World Report with Shirley! Watch the trailer of “Edible Gardening” on Garden World Report with Patti Moreno, Mel Bartholomew, Susan Appleget-Hurst, Mary Ann Newcomer, Mark Highland and Shirley Bovshow! The Garden World Report is the first live garden television show on the web! I can’t believe I’m doing it all solo too. I call this “recession broadcasting” because I can’t afford help! I write the stories, shoot the video, edit the clips, cast the guest contributers, scout the taping area, setup the live feed for the show, turn on the camera, get the sound system cranked, create the trailers, Twitter and Facebook every move to get the word out, finally, brush my hair, put on some lipstick, smile….and we are LIVE! Wow, its good to be hyper with a job like this! I was pleasantly Â surprised at the audience turn out for last week’s “test launch” from Raleigh, North Carolina! Viewership was “through the roof” and Â I felt compelled to produce another show for this weekend! I am ready for my live taping tonight at 5PM, PST here on EdenMakers. The focus will be on ‘edible gardening” Â and I will interview some garden TV stars as well. Expect an entertaining and informative 15 to 20 minutes of pure “garden world” fun. “ Mel Bartholomew, author of the Square Foot Gardening book and more. 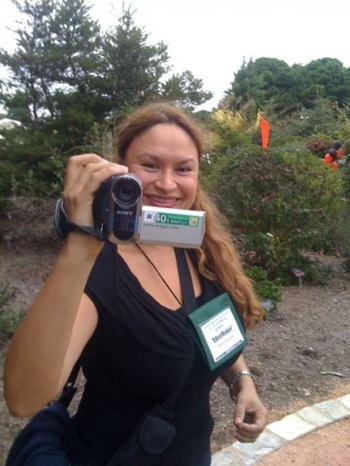 Garden World Report with Shirley is debuting a video Â series developed for our viewers called, “Be a Better Garden Blogger” with guest expert, Katie Elzer-Peters, a dynamic professional writer. I won’t say much more, but Amy Stewart, award winning author of “Wicked Plants” admits to crimes against plants. This sinewy labyrinth is the creation John Lyonnes for the Los Angeles Garden Show at the Los Angeles Arboretum. 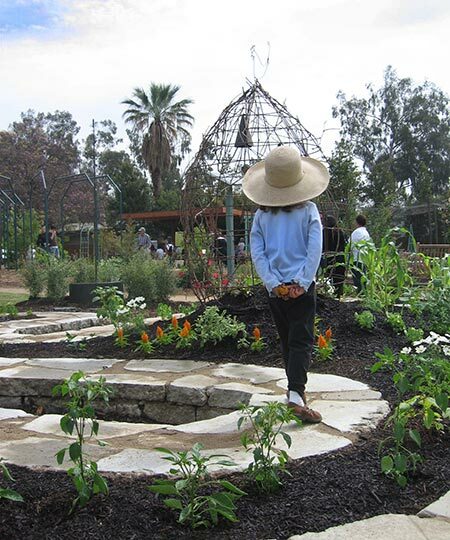 My guest co-host this week is edible garden designer and teacber, John Lyons of the Woven Garden in Los Angeles. Yes, he tends chickens, but more impressively, he is a beekeeper! Watch garden designer, John Lyons in his native, edible garden and follow him into his bee hive! Tune in guys, we have a live chat and will answer your questions! Garden television has never been more fun for me! You did a great job Katie. I’m glad the clips we did cued up okay and showed up on the broadcast. Thank God I had them because the live feed bonked. I’m going to record my show before hand and designate a viewing hour for chat interaction! You are fantastic. More to come! How is the Buffalo grass doing? Just a picture will do. No I know why even beautiful actors say they don’t like to watch their movies. BUT this was GREAT fun, Shirley, can’t wait for the next one. I’m thinking: adverbs.